A manuscript on SOCAT version 3 is under review in Earth System Science Data Discussion. 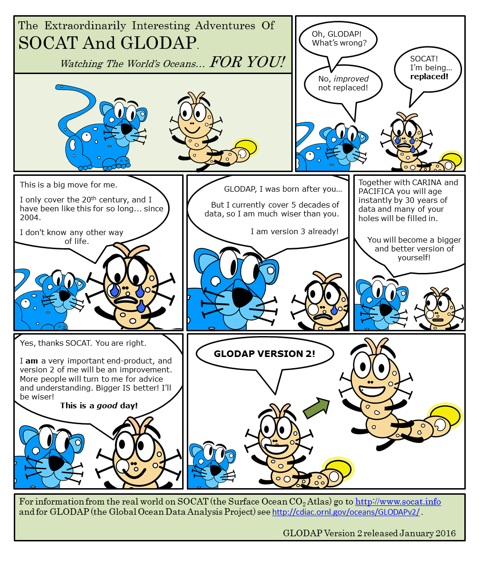 SOCAT and GLODAP has become a cartoon (made by Jo King). SOCAT/SOCOM event and release of SOCATv3 at the SOLAS Open Science Conference in Kiel, Germany. The event report can be found here. SOCAT publication on SOCAT Version 2 by Bakker et al. is available in Earth System Science Data. SOCAT release of Version 2 and Science Highlights, side event at ICDC9, Beijing, China REPORT. SOCAT publication about SOCAT and the SOCAT Gridded Product were published in Earth System Science Data. New member for the regional and global groups. More information can be found in the section ‘About‘.